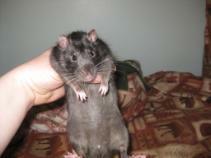 This pages is devoted to rescues and other rats that need homes. 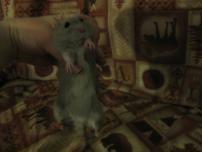 Please contact me by email and let me know which rat you are interested in. 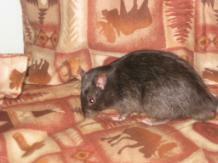 I have two male rats available named Orion and Gemini that were born here at FLRR on 6/11/12 (7 months old) Click here to see mom and dad. 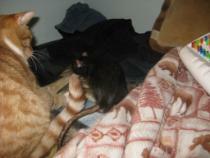 They had a wonderful loving home but, unfortunately, their family could no longer keep them. They have come back to live with me and are healthy, happy, and good little darlings waiting for another chance at a happy home. They are used to children and cats and love people and treats. 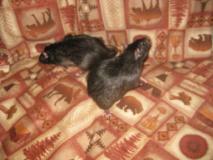 These two are typical ratty males; laid back, chubby, and lazy. :) Must go together. Contact me at not4u28@hotmail.com if you are interested in adopting them. 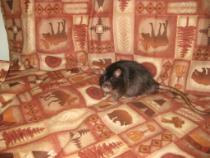 I have two female rats available named Lilly (Russian Blue Burmese Berkshire) and Ruby (Black Self) that were born here at FLRR on 12/05/11 (1 year old) Click here to see mom and dad. They had a wonderful loving home but, unfortunately, their family could no longer keep them because of a family member developing serious medical issues. They have come back to live with me and are healthy, happy, and good little darlings waiting for another chance at a happy home. They are used to children and love people and treats. They are females though and are busy busy busy. They like to "talk" to communicate with you about what they like and what they dislike. Must go together. Contact me at not4u28@hotmail.com if you are interested in adopting them. 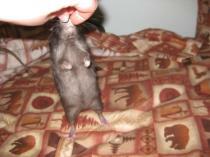 PLEASE CONTACT FOR MORE INFORMATION ABOUT AVAILABLE FLRR RATS.